Life at 7000 feet: You've Got (Virtual) Mail! John and I mail lots and lots of Christmas cards every December. I wish I could mail one to each and every one of you, but time and money keep that from being a reality. I can send some virtual mail your way though. Here is our photo and letter from this year. Merry Christmas! Old blue eyes thought that line too depressing. At Frank Sinatra’s request, Dean Martin rewrote it: hang a shining star upon the highest bough. I’d love to rewrite a little of this last year, but I can’t; old brown eyes has to tell the truth. She was not there on the day that he died, but a cell phone held to his ear carried a daughter’s benediction: I love you Dad. Meredith’s dad died on August 9th. We just celebrated Thanksgiving with Meredith’s family. Everyone was there, everyone except John. We are still folks of hope, but resurrection is empty without the thief called death. We are learning to muddle through. Kids keep you muddling by virtue of being young and needy and just plain beautiful. Will and Sarah are knee-deep in middle school. Abbey is technically in the second grade, but her best friends are her brother and sister, so she’s middle school in spirit. Most days you can find all three in hoodies, skinny jeans, and sneakers. And many nights, all three are slumbering in the same room in sleeping bags. I know it could change tomorrow, but for now our kids love each other’s company. Old brown eyes just says thank you. Marriage will also keep you muddling, especially when there’s something exciting on the horizon. Meredith and I have been married nineteen years now. Our hope is to celebrate twenty in a yurt in Yosemite next summer. There’s a picture on our refrigerator of two college kids, a lady and a tramp. Little did those kids know the stories you can tell of twenty years…my, my. Our plan is to keep at it so as to tell a few more, such as what it’s like to muddle for a week in a yurt. Stay tuned. Writing is keeping me busy. After quite a few years of hard plowing, we’ve seen a few blades of hope lately. Not full blown hope, but enough to soldier on. Touching Wonder: Recapturing the Awe of Christmas released in September. And I recently finished a book titled Start With Me; it’s set to release sometime in the spring. It’s a story about being a good Samaritan, among other things. I pray these upcoming holy days allow you to glimpse some sweetness in what’s been a heavy year all around. I know many of you have experienced loss times two or three, maybe even four. It is tempting in days like these to be about rewriting our lives, making them more upbeat, something to sell a few more copies. But that sure is tiring. Maybe time is better spent reminiscing and that’s something you can only do in retrospect, looking back, over your shoulder, telling the stories and being slack-jawed at the cockeyed ways in which the Grace that keeps this world kept you and yours as well. I, like you, look forward to a blue-eyed day of hanging a shining star upon the highest bough…but until then, may God bless us, everyone, and keep us all as we muddle through somehow. Merry Christmas to you all...such a beautiful family. Thanks for allowing us be a part of your world. oh that was nice. i enjoyed the letter and the card. i love that your kids sleep together. my daughters aren't as fond of their brother as yours are. i hope that changes. he can be a little annoying at 5. 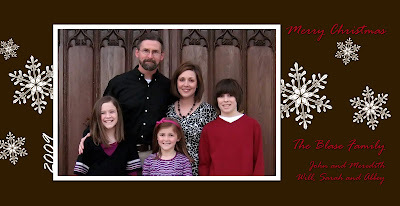 Lovely holiday photo of your sweet family, Mer. I wish you a blessed and joyous Christmas, dear friend. LOVE it! We just got ours yesterday, and THANK YOU!!!! I always look forward to catching up with you all! And your kids look so cute and grown up! It has been a tough year but I love that you have time to spend with your kids and your hubby and that you always seem to make the most of it all. I LOVE reading your blog! Very inspiring! Loved the letter and the pic. You're a fridge person now, friend. That's where the special ones go. Your card is looks so great! And your husband is just a gifted writer. The end. I love his way with words!! Merry Christmas to your whole family! I love virtual (and regular) mail this time of year! You have such a beautiful family. I've always loved the muddle through part of that song. Maybe it's the melencholy in me. Loved Johns words. You have a beautiful family. Thanks for sharing.